This post is part of an ongoing partnership with The Genius of Play. We received compensation in exchange for promoting play and its many benefits. Any opinions expressed in this post are our own. The holiday season is upon us, bringing us festive music, decorations, presents, and stress! Yes, the holidays can be especially stressful for everyone. Here’s a simple way to combat stress: PLAY! Play is one of the best antidotes to stress, anytime of year. So what better time of year to focus on adding some play to your day than the stressful holiday season? 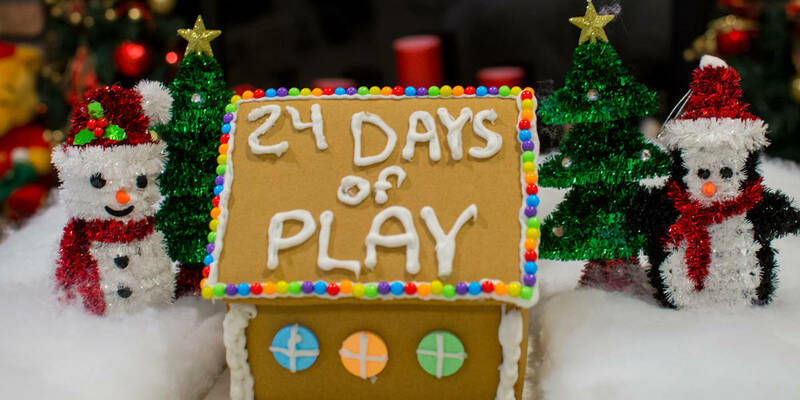 We took the idea of an advent calendar and came up with 24 Days of Play to help get you through the holidays by allowing the whole family to laugh and smile together. After all, isn’t that what the holidays should be all about? While different types of play may focus on one benefit more than another, you’ll find that most play has multiple benefits. Stimulate the mind and boost creativity. Improve relationships and connection to others. One of the biggest obstacles to play is finding the time to do it. This is even more true during the holiday season with everything we’ve got going on. The best part about these ideas is that they don’t take that much time. Creating the advent gives you that daily reminder to make a little time for play! 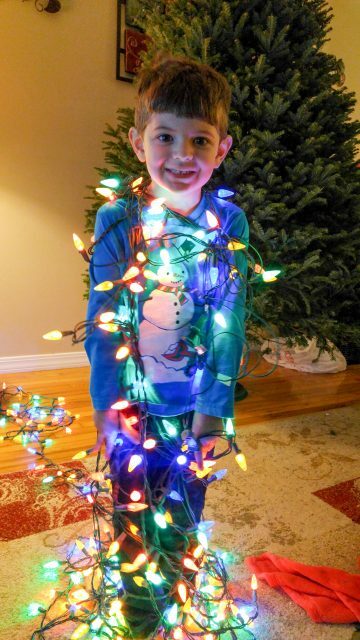 Here are 24 holiday-themed ideas you can use to get the whole family playing. At the end of this list we have a handy printable you can download and cut out to use to help get started! You can put pull them out of a hat, hang them on your tree, or have them delivered by elf mail! Have a Snowball Fight – Use snow, rolled up socks, pom poms or your imagination to have a snowball fight. Use that pent up energy and aggression in a safe and fun way! You may be surprised how much of a workout you get! Candy Cane Hunt – Hide candy canes around the house. Have the kids search for them together. They’ll have to exercise their minds along with their bodies to find them all! For an added challenge, you can write clues for them to decipher. Christmas Song Pictionary – Draw clues to guess the name of popular Christmas songs. You’ll have to put your brains to work as you flex your creativity and problem-solving skills, not to mention those fine motor skills. Have a Family Game Night – There are a number of games you can put a holiday twist on, or you can just dress festively and listen to holiday tunes while sipping hot chocolate and playing your family’s favorite games. The main benefit here is spending time together. Cupcake Challenge – Gather decorations and frosting to see who can create the most festive cupcake. The fun could even start by measuring those cognitive and physical abilities to make the cupcakes! Then add heaping portions of creativity! Build a Gingerbread House – Use toys, popsicle sticks, or any materials you have to create a gingerbread house. Put those brains to work thinking critically as well as creatively. Exercise those fingers, as well! Ice Cream Cone Trees – Decorate ice cream cones to look like Christmas trees! Creativity meets fine motor skills! Just try not to eat all the decorations! 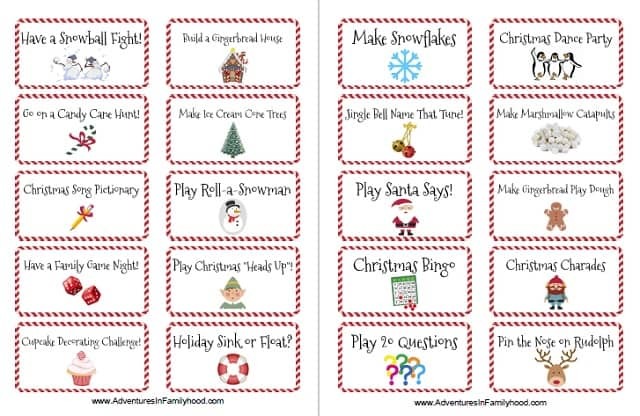 Play the Roll a Snowman Game – This simple dice game is surprisingly full of benefits. Fine motor skills will be needed, as well as your creativity and reasoning. Christmas Heads Up! – Write Christmas movies, songs, things on index cards. Try to guess which card is on your head. You can even use your phone! The fun is fast-paced and relies on being able to communicate and decipher clues! Make Snowflakes – Conduct a Borax snowflake experiment. This fun science experiment is a holiday brain booster that is easy to do at home! Holiday Sink or Float – Gather a collection of holiday items. Guess whether the item will sink or float. Then give it a try. This is mostly a cognitive game and the real fun begins when you come across and object you think should sink or float, but doesn’t. Then you can have fun trying to explain buoyancy to your kids! 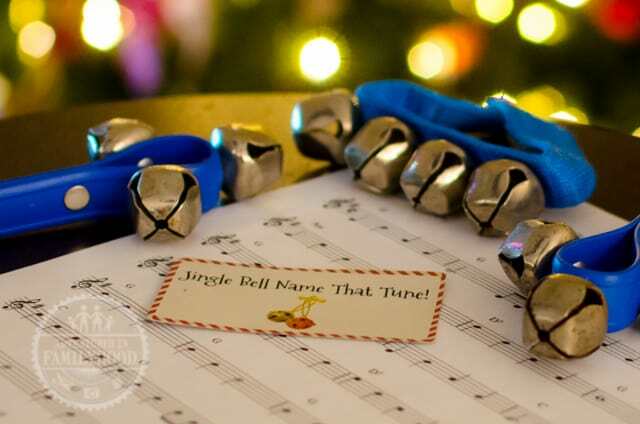 Jingle Bell Name that Tune – Use jingle bells to play your favorite Christmas song. Have others guess which one it is. This requires you to really use those listening skills along with your brain! Santa Says – Play a holiday themed version of Simon Says. Hone those communication skills and make sure you are listening closely! Play Christmas Bingo – Part of the fun of Bingo is the anticipation as you put your brain to work to figure out all the different ways you can win. The other part is paying attention and keeping track! Oh, and don’t forget to yell “Bingo!” as loud as you can! Play 20 Questions – Think of something Christmas-y. Have others ask questions to try to guess. This game boosts communication skills, puts those brains to work, and even has creative and social benefits, as well. Have a Christmas Dance Party – Put on some holiday tunes and shake your groove. This is all about getting that body moving and enjoying the physical benefits of play! Make Marshmallow Catapults – Make a catapult out of Popsicle sticks. See how far you can catapult a mini marshmallow. This will put your brain power and fine motor skills to work, while also allowing for creativity to be put to use. Make Gingerbread playdough – Follow the recipe to make your own holiday-scented playdough and create whatever your imagination can think of! This is not only great creative play, but also helps develop fine motor skills. If you involve the kids in making the playdough, they benefit by learning the science behind the fun! Christmas Charades – Act out your favorite Christmas Story and see if your family can guess it. This holiday twist on the classic game is centered on using non-verbal communication skills, but you can’t forget the physical, creative, emotional and cognitive benefits potential! Play pin the nose on Rudolph. – This is a classic game where you can make it as easy or as challenging as you like. There are obvious physical benefits, but your brain gets a workout as well from trying to remember where everything was. Go on a Christmas decoration scavenger hunt. – Driving around and looking at Christmas lights is one of our favorite things to do during the holiday season. Having a checklist to keep track of the different decorations you see makes the night extra fun and exercises those minds! If you find an area with lots of houses that are decorated, get out and walk for a bit! You’ll see the lights up close and the get the benefit of fresh air and exercise! Jingle Bells Memory Game – Use chocolate kisses or bells to make a memory workout game by writing symbols, letters, numbers on the bottom. Those little round price stickers work great! Possible themes are compound words, letter matching, picture matching etc. Trim the Tree – Create teams. Choose one person on each team to be the human tree. Use streamers, bows, ribbons to decorate the “tree”. Unleash the artist within! 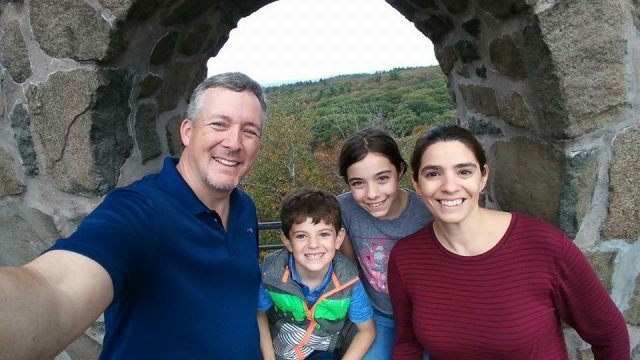 Christmas Mad Libs – Use your thinking caps to substitute the words in a Christmas Poem or Carol, “Mad Libs” style. Then laugh together as you read or sing them aloud! These are simple, yet fun ideas the whole family can enjoy. Many of them don’t require you to spend a lot of money, either. And without even thinking about it, you’ll all be getting the benefits! That’s the genius of play! For more ideas on ways to play, visit the Genius of Play website, and follow the Genius of Play on Facebook, Twitter, Pinterest, Instagram, and YouTube. We’d love to hear your thoughts! What is your family’s favorite holiday game?